The Artisan Food and Craft Market at Highbank Orchards’ Harvest Picnic was a great attraction with a wonderfully diverse range of stalls. Foodies will appreciate the great range of local produce with everything from Gerry O’Briens spiced beef, wild venison, Thomastown trout and caviar, award winning local cheeses from Stoneyford and Olivia Goodwillie’s famous Lavistown sausages. 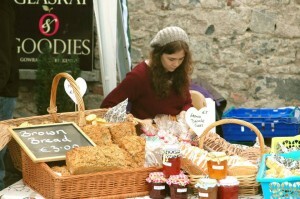 For the sweeter tooth there’s the temptation of Mary’s Slice of Heaven cakes, Highbank’s own hot mulled apple, cider and syrup and the perfect picnic ingredients from Glasraí & Goodies’ stall. Celebrate, explore and get active, with the Kilkenny Trails Festival – hikes, bikes and so much more, from 1st-29th September 2013! All trails lead to the Harvest Picnic at Highbank Organic Orchards, the Grand Finale event of Kilkenny Trails Festival 2013! Copyright © 2019 Kilkenny Trails Festival 2013. Powered by WordPress. Theme: Accelerate by ThemeGrill.